What keeps many CEOs awake at night is not knowing what they don’t know about what is going on inside their organisation. Is everyone behaving as they should or is there malpractice growing somewhere that could ruin reputation or expose the business to financial damage?. This article explains how CEOs can alleviate this anxiety by checking on the preconditions for malpractice and so identify ways to improve internal governance. How do you know that your organisation has integrity? The development of internal governance to deliver the confidence that every board requires is raised in many of the other articles in this edition of The OE. One of the ways in which we can improve governance practice is through creating benchmarks, undertaking gap analyses and devising governance development plans. Central to all of these initiatives is a suite of audit approaches and tools that can help guide development initiatives. 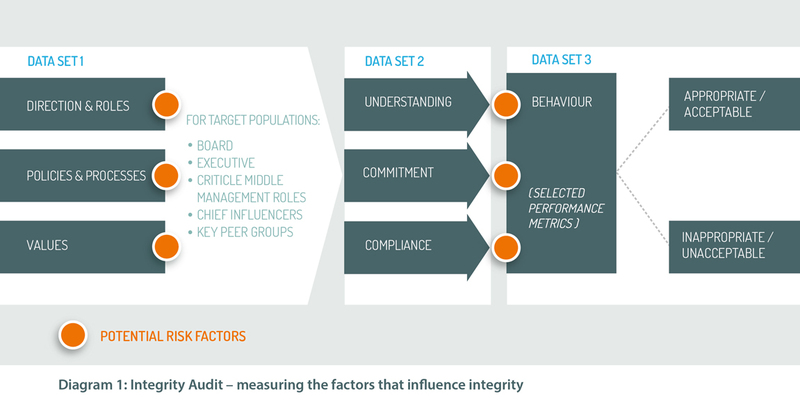 OE Cam has developed an organisation ‘Integrity Audit Toolkit’ that looks at a range of inputs to measure organisational integrity and its influencing factors. Through a series of desk research, interviews, focus groups and climate / culture surveys, we test the understanding, commitment and compliance to the direction, policies and values that have been set at the top of the organisation, by examining some of the attitudes and behaviours in key parts of the workplace. This then gives us a map of both the influencing factors and the ‘gaps’ in organisation integrity which guides us to pinpointing priority actions for improvement. The audit identifies three sets of gaps. And once you understand these gaps, it is then easier to put in place a development plan to better align behaviours to your company’s direction, policies and values. SET ONE: Is the organisation explicit about what it expects? The first set of ‘gaps’ is depicted in data set 1 in diagram1 above. For setting direction, we look for sufficient definition around the overall direction of the business and whether it is translated into a clear description of individual roles in supporting that direction. For role clarity, it is worth noting what has happened in the Financial Services sector, with the introduction of the Senior Managers Regime from March of this year. This requires the documentation of delegation of responsibilities and an explanation of how they will oversee the discharge of their responsibilities. To that end, we first build an organisational map of the business that evaluates the clarity of major accountabilities and the material decision making authorities and how they are cascaded down through the business. Clear about how they contribute more broadly to society (rather than purely financial / self-serving). Integrity is about the application of values. But first we need to know how explicit the organisation is about the behaviours it expects in order to live out its stated values. So the Set One Audit will effectively answer the question ‘Has the Board done its job in providing clarity of direction to the business?’ For without this explicit sense of direction, people in the organisation will be at liberty to define their own interpretation of the company direction, and the behaviours necessary for achieving its goals. SET TWO: Do those in the organisation understand, commit to, and comply with the direction, policies and values? To what degree do your employees understand and commit to the company’s direction, policies and values? And do they demonstrate that understanding and commitment in how they behave? This is more challenging to assess, as it it has to access people’s perceptions, attitudes and behaviours. The Key Peer Groups – these could be professional or even social groups within the organisation that as a collective are recognised as having high influence. Ensuring you identify and access these groups will be critical to knowing what is happening informally around the business. How do your Regional Managers interpret and act out your direction and values when under enormous pressure to deliver the numbers? For technology-based firms, what attitudes and behaviours do your technical experts exhibit that have a disproportionate influence on others in the business? We audit these segments for understanding, commitment and compliance as follows (see Table 1 above for summary). Through one-to-one interviews and focus group discussions, we get an understanding as to how aligned the articulation of the Direction, Policies and Values is in comparison to what is explicitly stated. For example, as an independent witness inside the organisation, we often hear different interpretations of what is meant by a company’s direction, or the behaviours that are important to exhibit, even though they may use the same language. The Board – The degree to which the Board agenda is focused on the Direction, Policies & Values (DPV). The Key Peer Groups – An assessment of the degree to which the Direction, Policies & Values resonates with the peer group’s own (probably implicit) goals. Here we want to see the actual behaviour in evidence for supporting the Direction, Policies & Values. – Decision tracking – how executive decisions are followed through to implementation. SET THREE: Do we have an ongoing integrity continuous improvement process in place? To build in continuous improvement requires a process of feedback and performance management that enables the identification of gaps and required improvement actions on an ongoing basis. So we check if you have reinforcing mechanisms in place to prevent the organisation from drifting into allowing inappropriate behaviours. These should be embedded into your normal business performance management processes, by defining a set of key performance measures that provide proxy indicators for integrity. Employee feedback, using independently generated employee opinion surveys, and the increasingly powerful social media employer review websites such as Glassdoor and Thejobcrowd. Auditing in this way provides robust information that forms the basis for building and maintaining a strong culture of integrity. It checks in with the key influencers around the business – if integrity cannot be found with these individuals, then the basic elements are in place for bad practices to grow and flourish. You can start this straight away by assessing for yourself how explicit the company is in expressing its direction, policies and values. And you can talk to us about identifying and then targeting an audit on the key populations of your organisation.